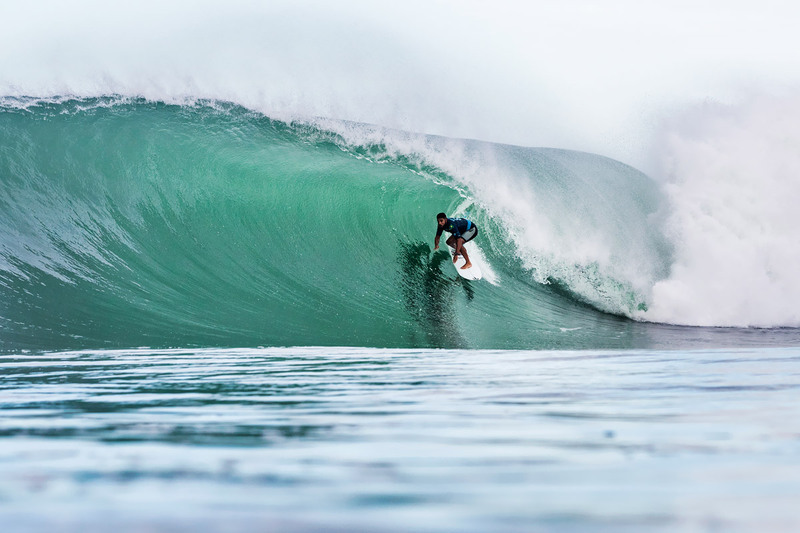 Jordy Smith has made it three 13ths in a row after Brazilian Ian Gouveia knocked the big man out of the 4th stop on the WSL Championship Tour, the Oi Rio Pro, yesterday. The surf at Barrinha - on the open coast east of Rio de Janiero - was very good for Brazil: 4-6ft and clean at times. Gouveia continued a run of upsets by taking down Smith in the opening heat of Round 3. Smith got the jump on the start, but halfway through the heat, Gouveia wove his way out of a deep barrel for a near-perfect 9.93. This result marks Smith’s third-consecutive 13th place result of 2018. Gouveia marches one step closer to his career-best result on the CT.
Brazilian youngster Yago Dora played spoiler today for World No. 1 Italo Ferreira (BRA) in Round 3 Heat 10. The all-star, goofy-foot showdown was slow to start but heated up in the last five minutes. Under pressure needing just a 4.47 (out of a possible 10), Dora landed a 5.23 air to earn the score and the win. Ferreira's loss leaves him in 13th place and in a difficult position to retain the Jeep Leader Jersey with Julian Wilson (AUS) still in the draw. 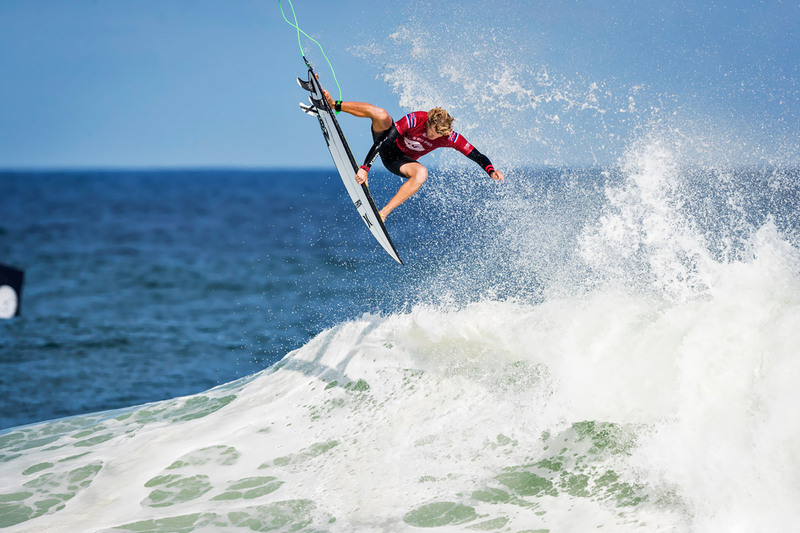 Two-time WSL Champion John John Florence (HAW) delivered the highest two-wave total of the Oi Rio Pro so far, a 17.97, which was made up of a near-perfect 9.80 and an 8.17. The 2016 event winner left no room for injury replacement Miguel Pupo (BRA) to gain ground with three excellent rides in a row. Florence advances to Round 4 where he will meet rookies Wade Carmichael (AUS) and Dora. Brazilian superstar Gabriel Medina had the crowd going crazy during his matchup against Mikey Wright (AUS). Medina locked in two back-to-back 6-point rides for an early lead over the replacement surfer and spent the remainder of the heat trying to land big airs for his family and fans on the beach. Wright came close to winning with two 6-point rides of his own but fell just 0.46 points short of eliminating Brazil’s first World Champion. Julian Wilson (AUS) narrowly beat former CT competitor Alejo Muniz (BRA) in Heat 6 of Round 3. The low-scoring heat only saw the Jeep Frontrunner earn a 3.17 and 6.17 for the win over Muniz, who captured a 4.77 and 4.17. Muniz came into this event as an injury replacement after falling off the tour in 2017. Both joining the tour in 2011, Wilson noted that his win was bittersweet due to their shared rookie class and battles over the years. 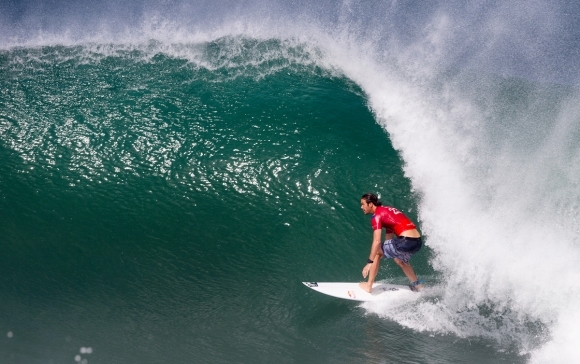 Filipe Toledo continued the winning-trend for the Brazilians in Round 3 by defeating Keanu Asing (HAW) in Heat 3. Toledo has yet to display the flair that made him famous at the Oi Rio Pro in 2015 but will have the opportunity to go big during Round 4 where the top two surfers will advance to the Quarterfinals and the loser will be eliminated. Rookies Dora, Carmichael, and Michael Rodrigues (BRA) are the last three rookies in the draw after the flurry of eliminations today. Rodrigues powered through two elimination rounds today, taking out Matt Wilkinson (AUS) in Round 2 and Frederico Morais (PRT) in Round 3. Carmichael eliminated Jeremy Flores (FRA) in Round 3 Heat 11. Rookie Willian Cardoso (BRA) was unable to join the freshman class in Round 4 after falling to Kolohe Andino (USA) Heat 4 of Round 3. Round 2 Heat 10 saw one of the most exciting exchanges of the event with Sébastien Zietz (HAW) and Joan Duru (FRA) battling barrel-for-barrel. The matchup produced some of the highest two-wave totals, eventually ending with Zietz securing the win with a 0.19-point lead in the last ten seconds of the heat. Zietz went on to defeat Tomas Hermes (BRA) in Round 3. Prior to his elimination, Hermes put on an exciting show for the crowd with a near-perfect 9.07 and win over Conner Coffin (USA) in Round 2 Heat 11. Kanoa Igarashi (JPN) also locked in two big wins today. First, Igarashi took down Connor O’Leary (AUS) in Round 2. Later, in Round 3 Heat 5, Igarashi was responsible for dispatching good friend and rookie favorite Griffin Colapinto (USA).